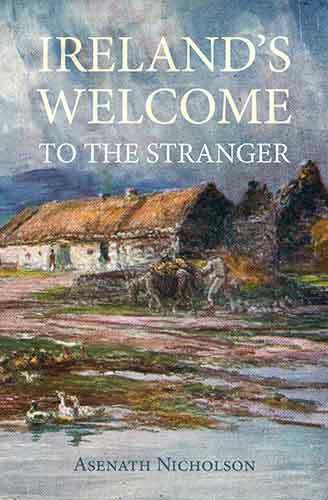 "For time to count his ages by,"
in close proximity with a cottage ornée; the ruins of an old castle hold pleasant neighbourhood with a neat school-house; and in the vicinity of the shapeless remains of the ancient abbey, the white walls of a modern church gleam through the foliage of the surrounding trees. Of the Round Towers of Ireland we have already spoken at some length. 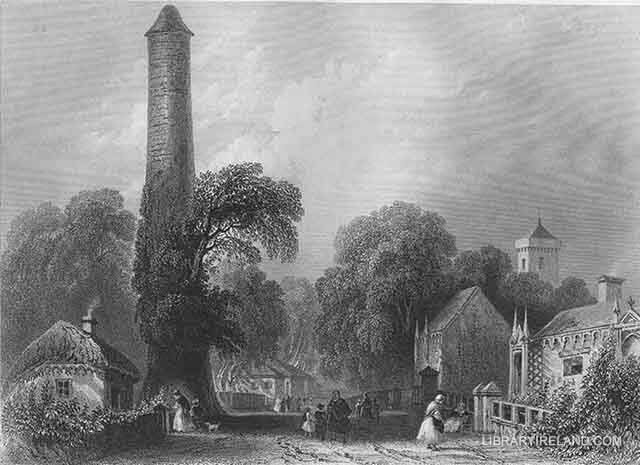 We shall therefore merely observe that the pillar at Clondalkin, which is one of the plainest in the kingdom, is eighty-four feet in height, the diameter fifteen feet. The doorway is about twelve feet from the ground, and near the summit are four square openings or windows, from which the prospect of the surrounding country is extremely fine. There are no traces of a staircase in the tower, but ladders have been put up to enable the curious visitor to reach the uppermost story. Clondalkin was originally a Danish camp, or fortress, and continued to be a favourite place of residence of these barbarous people while they maintained their sway in Ireland.